The pig’s eyes blinked. It struggled in a panic to escape from her. Look as she might, Circe could see no traces of human intelligence in its face. With a sigh, she released the animal, and it rushed away, to the yard where the other pigs grunted and ate and slept. She stood up, suddenly weary. She hadn’t really expected that any of this crew would have the strength of mind and character to change back. She had tried because she hoped, but she had known better. Another failure. More denizens for the island, but no man to share her secrets, to work with her. She didn’t usually give in to loneliness. She had much to do, much to study, much to learn. Sometimes she thought she would be better off if she gave up on the idea of a soul mate, a companion who would understand her. She’d done well here without any, hadn’t she? Perhaps she was asking too much. It was just that some of them came close. Sometimes, not usually with the pigs, but sometimes with the nobler animals, the lions, the eagles, she could see that spark of humanity in their eyes, and she almost believed that this one would be different. This one would know who he was, despite the change of shape. This one would be able to hold onto himself and retain his humanity no matter what. Some had come so close, she had seen the glimmer of the human form beneath the animal’s shape. But it was never more than a glimmer. Circe returned to her still room, where she mixed the potions and added them to the wine. One of the tinctures needed to be heated a little more, and another of the combinations was beginning to smoke. She moved the pot away from the fire and stirred it thoughtfully. She’d heard the other sailor in the underbrush, the one who ran away without coming to her table. Would he be back? Would he bring others? She didn’t know whether to hope for others or not. Circe had become absorbed in the mixing of the potions, and updating the records of the earlier potions. She heard the footsteps of a man, slow, careful, and then his voice. “Who is in there?” It was a deep voice, a strong, vibrant voice. She instantly knew this was no man she’d met before. She poured the potion into the wine carafe, and waited the length of a breath, for it to mix completely with the wine. Only then did she step out into the entrance hall. The man who stood there told his life story by his stance. His skin was sunburned and wind burned. There were lines around his eyes from squinting in the brightness, and, perhaps, from smiling. He stood planted in her entryway, a man who commanded, a man who would not slip or fall, a man who had been favored by the powerful in the past, a man who knew his own power. Not merely a sailor, she thought. He has been at sea, but he has commanded the ship, as he has commanded much. Including himself? Oh, she hoped. “You are welcome, Odysseus, and I hope you will share wine with me and enjoy my hospitality.” She turned and walked to the table, the wine jar in her hand. He hesitated a second or two and then followed her. He sat at the table, relaxed as they all were at first. There was something, a twinkle in his eye, the hint of a smile around his lips, that made her wonder what he saw, what he knew, what he expected. Never mind, she thought. She poured him wine and handed him the cup. She poured some for herself, watching him all the time. “That can hardly be true,” he said, smiling at her now. He paused a second, watching her holding her own cup. She drank hers down. It was perfectly safe; she was immune to her own potions. He blinked and lifted the cup to his lips. He drank as if he had been dying of thirst. Then he blanched, put the cup down, very carefully, on the table, and stared at her. “What have you done to me?” he asked, his deep rich voice suddenly thin and strained. He pushed the chair away from the table, his hands clenched on the edge of the table. Already it was happening. His arms muscled, his hair lengthened, his body thickened. His eyes remained the same, angry, surprised, hurt even, but was there a touch of something else? Something like confidence? He couldn’t answer, not yet. The change rippled through his body, taking his voice, his ability to think. He roared, not quite a lion’s roar yet, but more than a man’s. His very bones shrank, thickened. His face lengthened, his features changing as his face covered with tawny fur. He threw back his head and roared again, and this time it was a lion’s voice, coming from a lion’s body. “Why have you done this to me?” he asked, plaintive but with an undercurrent of anger. “And you would share your power with this person?” he asked, serious. She half closed her eyes and saw his human form coexisting with the lion. “I would,” she said. It was safe enough, usually, because the man who asked would never be able to change back. With Odysseus, she wasn’t sure how safe she was. He stretched himself, looking back at his leonine form, his magnificent mane, his powerful claws. He scratched his claws on the marble floor, without result. He closed his eyes, furrowing his lion’s brow. His muscles tensed under the tawny coat, and she could almost see the air burn from the force of his concentration. She clenched her own fists. He won’t do it, she thought; they never do it, no matter what they seem like during the preliminaries. It was foolish to hope, but she found her breath constricted in her chest as she watched. He winced with the effort he made, and swallowed hard a few times, and then, for the first time ever, she saw the change begin to reverse. It began with his hands and his arms first, and then his face, and then the rest of his body. She could see the lion for some time during the change, as Odysseus concentrated on different parts of his body and as they began to reshape themselves into human contours, human colors, human shapes. He opened his eyes, human eyes in the last vestiges of a lion’s face, and then the change flashed to completion and he stood before her, the man who had stood in her entryway moments before, as if no change had ever occurred. “I don’t believe it,” Circe breathed. Her heart began to beat again as if time had stopped for a while and then restarted. “Yes! I am king there, and with you at my side, there is nothing we couldn’t do. You could teach me your magic, and we could rule as gods do.” His eyes glowed with enthusiasm. The gods, thought Circe, do not always rule wisely. She didn’t say that to him. “Please, Circe? Consider it. Consider what we could achieve together. I have never met a woman like you, and you said yourself that you were looking for a man like me. You are wasted here on this island. You are meant to be a part of the larger world, where you would gain the glory and honor you deserve.” He clutched her hands in his, holding them so tightly he nearly crushed them. Again she felt a shiver of something like premonition. It was not wise to speak of the gods that way, she thought. They would make him pay for that. “I will think of it,” she said, “and will come back with an answer.” She turned and left him, heading for the grove where none of the animals ever went, where she knew she would have privacy to think. As she left the grounds of her house, she saw Brytar, one of the other lions, lurking near the open door of the building. That struck her as odd; Brytar seldom went near her or the building anymore. Perhaps he’d heard or smelled Odysseus’ change and was curious. She thrust the idea of Brytar from her mind and proceeded to the grove. The sun shone there hours after it had left the rest of the island. Outside the trees, the sun had begun to drop below the horizon, but here Circe was bathed in golden light. She felt stronger, more herself, when she entered the grove. Was he the one? She tried to close her mind to his human magnificence. Yes, he was a commander of men, a king. She could see that in him. He had traveled far, and faced perils; that, too, was written on his face, scored in his muscles, his movements. The power she had to share, though, was more than any king had ever had at his command, and more perilous than anything this one, or any of them, had ever faced before. Should she entrust it to him? He had changed back, she reminded herself. He had struggled briefly, but he had found the way back. He knew who he was; he was not disturbed by the outward signs of things. He would not, she thought, fall victim to the glamour of the power. He would not allow himself to be corrupted by it. He knew himself. He alone, of all the men she had changed over the years, had turned his back on the power of his other form and returned to the human. He could be trusted with other powers. She could trust him. And return with him to his kingdom? She hadn’t considered leaving her island in decades. Once, yes, when she’d first arrived here, she’d held dreams of triumph in the world of ordinary people, of being able to rule over them all. But that was long ago, and she’d outgrown those dreams as she saw what men were like, how easy it was to keep them animals forever. Men hadn’t changed, she knew, even if she had found one who was different. And yet, to have him at her side, to share her power, her responsibility, at long last. To be able to return to the world, to take her place where she belonged, to be looked up to, to be admired, feared, even. She could feel the desire, the need, rising in her, burning through her skin like a blush. She wanted it. She had never completely given up on the hope, the possibility; she had deluded herself all these years, told herself that she was content but continued feverishly concocting the potions, waiting and hoping for the one who would be ready for her. Then she allowed herself to remember Odysseus the man, and her blood rushed to her skin, and she felt hot all over. To partner a man like that would be something. She remembered the touch of his lips on her hands, and she burned again. She wanted him. She would have wanted him even if he hadn’t passed the test, though she would not have acted on that desire if he’d failed. But he hadn’t failed, and she wanted him. She wanted to be with him, now, and she wanted to go with him when he returned to Ithaca. At last, she thought, her self-imposed exile would come to an end. She raised her arms in the rays of the setting sun and answered the question in her heart. Yes, she thought. Yes, I will return to Ithaca with him. Yes, I will share my life with him. Yes. The last drops of the sunset caught in the upper branches of the trees as she passed out of the grove. Outside, the world was in darkness, but she knew her way back to her house. She heard the animals stirring from their homes in the forest, in the darkness. If she tried, she could remember all their names, but she didn’t need to, not anymore. Perhaps she would even free them, when she and Odysseus left the island. She hadn’t decided on that yet. He was not in the building when she walked through the entrance, but she heard him moving in the long grass outside the door, and he appeared in the candle light moments after she returned. There was something different about him, a slight tension in the way he held his shoulders, a strain somewhere around his eyes, and Circe, noticing this, wondered if this were bodily memory of being a lion. Sometimes, she saw the others make remarkably humanlike moves in their animal forms; perhaps this was the reverse. Or perhaps he was worried about something. “Yes,” she said, “all my gifts,” and she kissed him long and hard. They pulled apart, looked at each other for a moment of hunger and desire, and then she led him to her bedroom. He slept afterwards, and she surprised herself by falling asleep beside him. She usually prowled in the night and slept by day, but she must have fallen into his rhythms of sleep and wakefulness, as she had fallen into his other rhythms in bed. She only knew she’d slept when suddenly she awoke to find herself alone in the bed. For a second, before she came to full waking, she wondered if she had dreamed Odysseus entirely, but then her senses returned and she heard his footsteps elsewhere in the house. She held herself quiet and listened until she could identify the tiny sounds of porcelain. He was in her stillroom, she thought, but why should he be there? Hadn’t she warned him about the potions? She could have called out to him, and certainly he would have answered, and all that happened after that would have been different, but she didn’t call him. Instead, she rose silently and dressed herself, still listening to his small sounds in the other room. He would not pass this room on his way to the ship, if that was where he was going. Circe saw him leave the building and stride out to the woods. He carried something with him, something he feared to drop, judging by the way he sheltered it when he stumbled. It had to be one of her potions, Circe thought, but she couldn’t understand why he would want one, and why he would walk away from where his ship was moored and toward the part of the island where the other, more dangerous animals dwelled. She thought of Brytar again, and his curious appearance near the house when she’d left for the grove. Could Brytar have met with Odysseus, challenged him in some way? Knowing what she knew of Brytar (another one she’d hoped would have the strength to pass the test), she thought it likely. But Brytar was a lion, and Odysseus merely a man, though a special man. If Brytar chose to be treacherous, he could easily kill a human being. Perhaps Odysseus took the potion as a way of improving his chances with Brytar, Circe thought. Since he could change back to man shape by himself, he might feel confident enough to try another lion potion. That was assuming that he’d found the right potion and hadn’t accidentally taken something deadly. Circe had to follow him, to protect him if need be, and to discipline Brytar, if need be. She had the advantage over Odysseus: she knew the island well, and wouldn’t need moonlight to find her way. She recognized the path Odysseus took, and judged his pace as slow enough that she could easily catch up to him before he met with Brytar anywhere but at the very edge of the woods. She ran lightly along the path, until her foot caught the edge of the rock sticking up. She tripped and caught herself before she crashed onto the ground. How odd, Circe thought. She knew this path well, and there were no rocks rising out of the ground there. She turned to look at the rock, now moved by the impact of her foot. It was about the size of her fist, and had been buried deeper in the path before. Now it didn’t completely fit into its original hole. She lifted the rock. Someone had placed some green leaves there, and covered them with the rock. How strange, she thought, as she removed all the leaves. She didn’t recognize them. They were from no plant that grew on the island; she was sure of that. Someone had hidden them here, she thought, and as she placed them in a pouch attached to her belt, she felt a profound uneasiness, as if she had put her hand into a hole that might contain a poisonous snake. When she headed along the trail again, she was more careful of the surface, but nothing else was amiss, and she heard Brytar’s voice as she neared a clearing. She paused in the trees, where she could see and hear but not be seen. Circe felt her heart turn cold and hard, a block of ice in her chest. She breathed in as silently as she could, and listened. Odysseus flushed in the light of the half moon. “Yes,” he said, “I have it.” He opened his hand and Circe recognized the container. 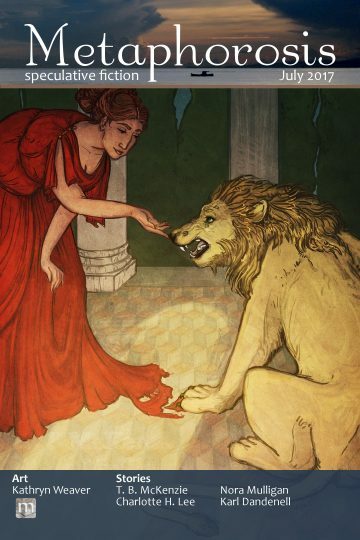 He must have read her notes, she thought, and found the lion potion. “I’ll prove to you how it works.” With one fluid motion, he poured the potion down his throat. The lion potion worked quickly even diluted in wine. Without the wine, the effect was almost instantaneous. Circe saw Odysseus sharing space with the lion for a second or two, and then he was completely a lion again, the bottle shattering on the ground nearby. Brytar growled, “You liar! You cheat — “but he didn’t get a chance to say more before Odysseus attacked him. Brytar had been a lion much longer than Odysseus, but he had been thinking like a man in the clearing, and Odysseus had the advantage of surprise. He knocked Brytar down in his first leap, and his great teeth met in the other lion’s throat, while Brytar struggled and clawed at him. Circe watched it happen. She could have stopped Odysseus if she’d chosen to do so. In the instant of Odysseus’ attack, she was so angry at Brytar for opening her eyes that she wanted him dead as much as Odysseus did, and for the same reasons. In any event, her opportunity passed quickly. Brytar lay dead on the ground, blood splattering the grass and trees, when Circe walked out into the clearing. “It was him or me,” said Odysseus earnestly. His teeth were red, and gore dripped off the fur of his chin. His mane was stained with blood. He was breathing hard. She wondered if he would try to make a break for it. She could almost see him considering it, planning what he would say if she caught him. He shuddered and closed his eyes as if he were trying to remember who and what he was. “Or do you need help?” she asked. “Perhaps you forgot something. Something you left along the path, hidden under a rock. This, perhaps?” She opened the pouch and held out the herb so that he could see it. Odysseus stared at the herb hungrily and then looked at Circe herself. “I can explain,” he said. She closed her hand on the herb. “No,” she replied. “You don’t need to say anything. You’ve already made it perfectly clear. You lied to me, Odysseus. You tricked me and I let myself be tricked. I wanted so much to believe that you were the one. But you’re not.” She turned her back on him. A shudder began somewhere down by her hips and swept through her body. She thought she might vomit. “You will leave my island, Odysseus, you and your crew. I never want to see you again. If you are not off my island by sunrise, I will turn you into dirt, all of you.” She dropped the handful of herbs onto the path, and stalked off. Her eyes burned, but she had too much pride to let him see any tears fall. She stopped at the pigsty on her way back. All the pigs woke from their sleep at the sound of her footsteps and gathered around, eager for food. She picked out the ones who had come from Odysseus’ ship, and drew them aside. “Here, pigs,” she said, “I have something special for you. You will turn back into men, and you will return to your ship, and you will see nothing on the way, and remember nothing when you set foot on the ship.” She concentrated and said the words of power, low, under her voice, and then stepped back. The men stood before her, looking dazed and stupid. They didn’t look at her, and they didn’t look at each other, but all began walking past her house, in the direction of the ship. A while later, she heard the sound of the boats rowing out to the ship. “You’re too late,” she said. “Didn’t I say you were to be off my island by sunrise? You have very little time left.” She studied the horizon. She wouldn’t look at him. She heard him walk away, around the side of the house. She wouldn’t turn to see him even then. She continued to stand there, watching the sunrise color the sky, until she heard the boat leave the shore and head out toward Odysseus’ ship. Then she allowed herself to look at the place where he’d stood. Rosy sunlight colored the floor, outlining the herbs left in a pile on the doorstep.